At only 17 years old, Victoria Duval, the Haitian American professional player of tennis is off to an impressive start after winning her First-Round Match at the US Open. Her recent victory is a testament to the difference a year can make in a dedicated athlete's life. Just last year, the youngster was disappointed by the loss to Kim Clijsters in straight sets during her first try at the US Open. This time around, she saw her first triumph, over Samantha Stosur of Australia, Champion of The Open in 2011, and Top 15 player, with scores of 5-7, 6-4, and 6-3. Born in Miami, Victoria Duval lived for years as a child in Haiti, and trained in Port-au-Prince at the JOTAC Tennis Academy. At eight she returned to the States and resumed training at Atlanta's RCS Tennis Academy. With her trainer, Nick Bollettieri, Duval took her right-handed, two-handed backhand technique to her career highs of no. 717 for doubles, achieved in October of 2012, and a ranking of no. 285 for singles in May of 2013. 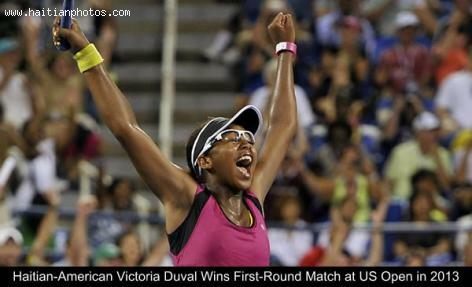 The young Haitian-American Victoria Duval pulled quite an upset Yesterday (August 27, 2013) at the U.S. Open. She defeated the 2011 champion Samantha Stosur in the US Open first round tennis tournament. Ranked at No.296, Duval scored a 5-7 6-4 6-4 win against the 11th- Australian. This is actually, her first grand slam victory. 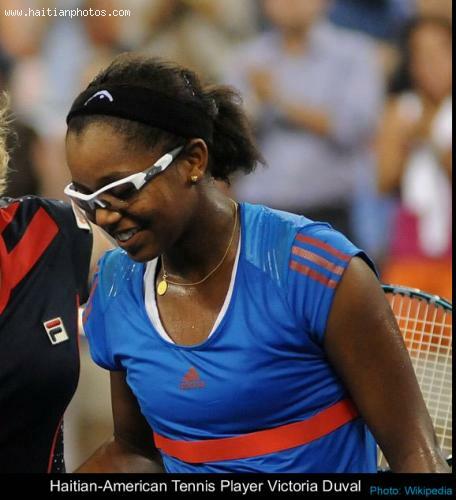 This victory by the 17 year old Haitian-American Victoria Duval over the 2011 champion Samantha Stosur in the US Open is quite remarkable but it gets even more interesting. She had two major ordeals that she already coped with. She experienced the terror of being held hostage by a kidnap gang and almost losing her father in the 2010 Haiti earthquake.